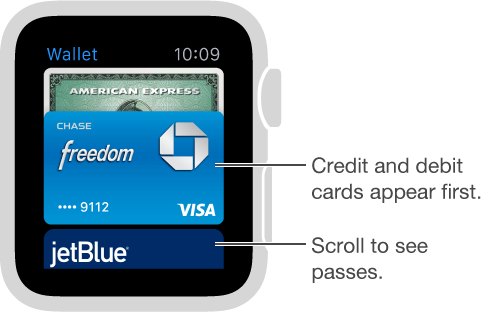 Use Apple Pay on Apple Watch to make purchases in stores that accept contactless payments. Just set up Apple Pay in the Apple Watch app on iPhone, and you’re ready to make purchases—even when you don’t have your iPhone with you. You can add up to eight credit or debit cards, including store cards; they’ll appear at the top of the stack in the Wallet app , above your passes. If you unpair Apple Watch, disable your passcode, or turn off wrist detection, you can’t use Apple Pay, and any cards you added to Wallet are removed. Note: Many credit and debit cards, including store cards, can be used with Apple Pay. For information about Apple Pay availability and current card issuers, go to support.apple.com/kb/HT6288. Set up Apple Pay on Apple Watch. Open the Apple Watch app on iPhone, tap My Watch, then tap Wallet & Apple Pay. 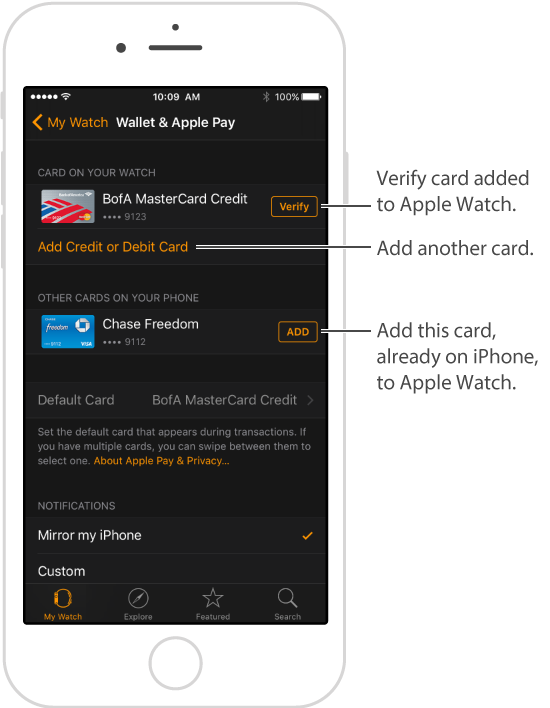 If you’ve already added a card to Wallet on iPhone, you’ll see it listed and you can tap it to add it to Apple Watch. If not, tap Add Credit or Debit Card. If you have a supported card on file with the iTunes Store or the App Store, you can enter that card’s security code. For any other card, including a store card, use the iPhone camera to capture the information on your card, then follow the onscreen instructions. Your card issuer may require additional steps to verify your identity. Add another credit or debit card. Open the Apple Watch app on iPhone, tap My Watch, tap Wallet & Apple Pay, tap Add Credit or Debit Card, then follow the onscreen instructions. Choose your default card. In the Apple Watch app on iPhone, tap My Watch, tap Wallet & Apple Pay, tap Default Card, then select the card. Pay for a purchase. Double-click the side button, swipe to choose a card, then hold Apple Watch within a few centimeters of the contactless card reader, with the display facing the reader. A gentle tap and beep confirm that the payment information was sent. Find the Device Account Number for a card. When you make a payment with Apple Watch, the Device Account Number of the card is sent with the payment to the merchant. To find the last four or five digits of this number, open the Apple Watch app on iPhone, tap My Watch, tap Wallet & Apple Pay, then tap a card. Remove a card from Apple Pay. 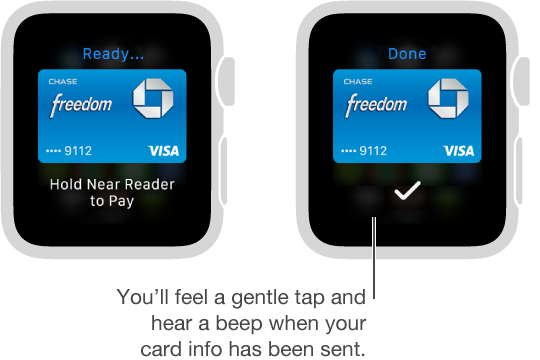 Open Wallet on Apple Watch, tap to select a card, firmly press the card, then tap Delete. Or open the Apple Watch app on iPhone, tap My Watch, tap Wallet & Apple Pay, tap the card, then tap Remove. If Apple Watch is lost or stolen. If your Apple Watch is lost or stolen, sign in to your account at iCloud.com and remove the ability to pay using your credit and debit cards in Wallet. Go to Settings > My Devices, choose the device, and click Remove All. You can also call the issuers of your cards.